It's a rockin' good time. 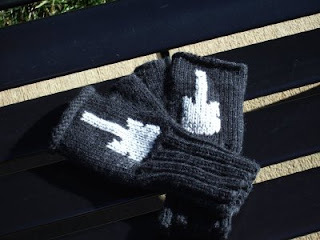 Inspired by Alex Skolnick (a FABULOUS guitarist), I designed these. I have the pattern all written up, and I'm ready to post it. Are you ready? First of all, it will be offered in Ravelry, and secondly, I may see if I can post it here (just have to figure out how). I've been busy, even if I haven't been posting. 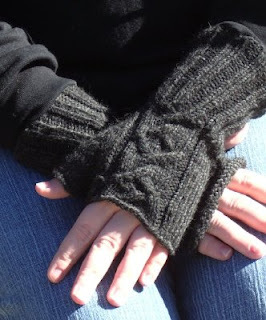 I'm also sending a copy of the pattern and the actual mitts to the inspiration (just because I can!). Let's hope it's received with a warm welcome, even though they'll be sent in July.